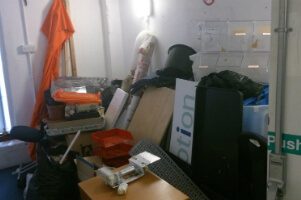 Tower Hamlets E Domestic & Commercial Junk Removal | Quality Property Care Ltd. Residential and commercial junk removal is the most optimal solution for loft clearance, office clearance, house clearance, builders waste removal and waste disposal, garden waste removal and all clearance cases with big junk amount offered. To get more info, contact us, please on 020 3746 4287. You can contact our polite customer support associates! Timber, bricks, glass, wood, rubble concrete, plasterboards, metal, soil, tiles and ceramics, plastic and cement are most of the typical materials we get rid of. With this service we charge PER WEIGHT and not by how much time it takes us to remove said rubble. The most popular materials we remove are cement timber, rubble, and soil all of which are disposed in their proper places, responsibly and safely . There are materials which we will not remove like medical waste, food, paint or other dangerous substances like asbestos. We do not remove chemicals and all medical waste kinds like gloves, syringes etc. Quality Property Care Ltd. has been delivering its professional junk removal services to the businesses and residents of the region for more than 10 years. The ambition and experience of the operations have enabled the establishment of very affordable, efficient and eco-friendly clearance, waste disposal services and waste removal. 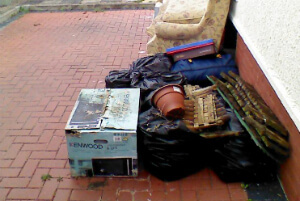 The clients will basically spend less money by hiring the professional waste removal and disposal services of the firm, rather than hiring a skip, as well as working with the council. The firm has vans to load and transport the rubbish, and works with a number of recycling centres and disposal sites in Tower Hamlets E, so that there is always dumpster which is quite close and is ideal for disposing the stored junk. Those moments, when you keep holding and stop throwing old stuff, come to every of us. Whether we don`t have enough time or the materials to remove the junk, it gets more and more. And one day we wake up in a house full of junk. Or we turn out to come in unpleasant and repulsive working environment. No need to move or dismantle anything at all! The professional technicians from Quality Property Care Ltd. will dismantle all the big junk and furniture and pack the pieces, themselves. If you have more issues or details you want to get, speak to us and we will arrange the professional junk removal service in a most hassle-free for you time and way. Our service is helpful to your needs, whether you want a one time removal or you prefer booking a frequent visit each month or so. For business customers we have special equipment, with records allowing us to dispose of construction materials like timber, concrete, rebar and so forth. All of our workers are up to standard with the proper training and certificates to complete a job without any hassle or delays. Property managers and landlords get exclusive rates for bulk ordering even during weekends and bank holidays. The service involves house clearance, domestic services, garage clearance, loft clearance, small house appliances, garden clearance,, shop clearance, commercial services, furniture disposal, Construction waste disposal service, it disposal, office clearance tire disposal as well as builders clearance and refurbishment waste disposal. We work with beds,wardrobes, sofas and armchairs, living room storage, coffee and side tables, bedside,, cot beds storage, dining tables and dining chairs storage, garden tables, shoe cabinets, racks and stands, bedside tables, dressing tables, chest of drawers, TV stands and cabinets, shelving units, mattresses,, console tables, desks and chairs, bunk beds,, playgrounds,free-standing kitchens, sideboards, and modular kitchens. For gardens we remove chairs, barbecue, umbrellas, benches,, hallways shelf, cabinet stands and racks, hangers and hooks, walls shelves portmanteaus and baskets. To book this service call 020 3746 4287 and specify your needs, how much we are removing and what sort of materials we have to remove. Ensure that they are quickly accessible as this will make our job a lot easier and lower the hassle we have to go through. Use the booking form to get more answers or to book directly, without any delays. The customer support center is available so please feel free to call any time you need us, all free of charge and without any commitments to our firm. We can talk to you and come for a viewing free of charge, if you call ahead of time.